Customer satisfaction is our number-one focus when building propane trucks, bobtails or transports at BT&T. After 34 years in the business, we have many customers around the world who have been pleased with our quality trucks and service. 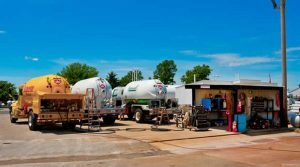 Our customers typically have a positive experience from the moment we establish a work order for your propane unit through services rendered during the life of your propane truck. We show it in our workmanship and in our flexibility as we accommodate all of our customers’ needs and unique truck specifications. These are our recent propane industry customers who have purchased a propane truck or fleet of trucks from us over the last few years. We are happy that they are all satisfied customers. Enjoy an up-close view our customers by opening any photo below. Click on the photo to end the show.